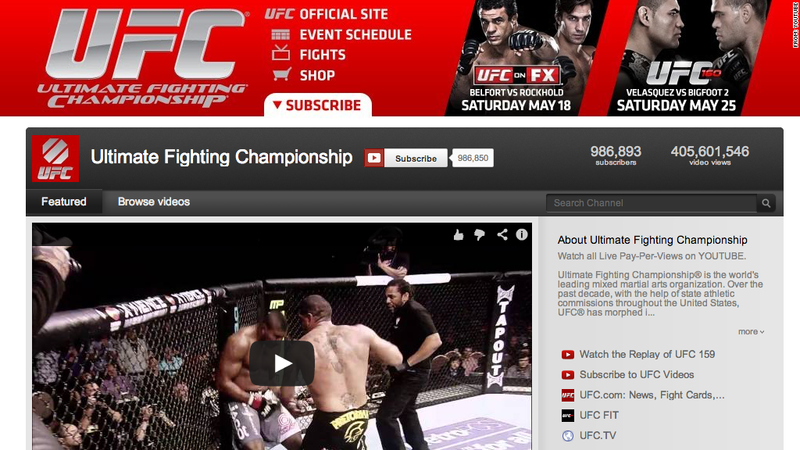 UFC is testing out a new paid subscription service from YouTube. YouTube is launching a pilot program in which users can pay to subscribe to channels like Ultimate Fighting Championship and Sesame Street. Subscription fees start at 99 cents per month, and viewers can test out a channel for free as part of a 14-day trial. Once they sign up, subscribers can watch the paid channels on phones, tablets, PCs and connected televisions. YouTube, owned by Google (GOOG), said in a blog post Thursday that the company wants to help content creators get paid for their videos. "Today, there are more than 1 million channels generating revenue on YouTube, and one of the most frequent requests we hear from these creators behind them is for more flexibility in monetizing and distributing content," the blog post read. YouTube named out only Sesame Street and Ultimate Fighting Championship (UFC) as launch partners, but the company said it plans to roll out subscription options for "qualifying" content creators in the next few weeks. Google didn't say what portion of the subscription fees go to the channel owners. If YouTube is able to attract more premium content, the a la carte offering could be extremely attractive to would-be cable cutters tired of paying $100 or more per month for a slate of channels they don't want. Still, the streaming-video space is complicated and choked with competition -- and YouTube may not necessarily want to wade fully into competing with the likes of Netflix (NFLX).